Excellent Wenny! Now exists, so being grateful Now changes our reality Now, making us a magnet to good as we see more good things in our lives. awesome. we should always be grateful for our everyday. sometimes things amy seem tough but otehrs may even be having it tougher than us. So true Evelyn ... if we think we had it bad we are definitely wrong. There are so many who are worst off than we are and yet they are still capable of being grateful for whatever that's happening in their life. So why can't we, right? Thanks Ryan! It's my pleasure to share. Being grateful keeps us positive and increases our good vibes to the Universe. Good for you for choosing to consciously focus on things to be grateful for. All too often, we are inclined to focus on what we do not like and do not have and fail to see all the good in our lives already. Not only does this focus make us feel better, it creates an energy to receive more good things. Thanks for the wonderful comments Kelli. 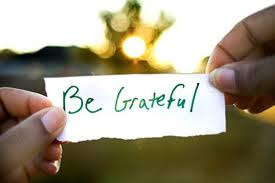 I find focusing on positive stuff, being grateful makes me happy and notice even the littlest blessings of the day.